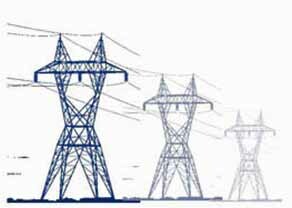 Is an EMP – nuclear attack on the USA imminent? “The Federal Reserve plan to crash the economy and make room for world government and an authoritarian globalist economic and accompanying police state control system will necessitate a sufficient prerequisite – and that prerequisite may very well be a new war on the Korean peninsula. 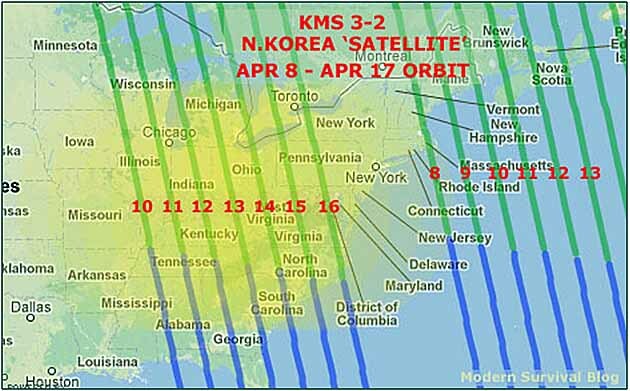 Given the recent nuclear threats from North Korea directed at the United States, the satellite orbital map shown above indicates the track of the KMS 3-2 “satellite” this week from Apr 8 – Apr 16, which coincidentally just so happens to orbit along the eastern half of the U.S.
On December 12, 2012, the Kwangmyongsong 3-2 (KMS 3-2) was launched into space on a polar orbit, and is said to be an “Earth observation satellite”. The satellite was not placed perfectly and is evidently tumbling every 17 seconds while it orbits the earth. From an EMP nuclear weapon perspective, the tumbling is apparently irrelevant. The altitude of orbit is approximately 500 km, or about 300 miles, the perfect altitude for EMP detonation for maximum range and damage. Coincidence? If U.S. ‘officials’ knew or suspected this, do you think they would tell us? I think not. It is pure speculation regarding the North Korean satellite being a Super-EMP weapon, and some may believe it to be conspiracy to even mention the possibility… but it is incumbent upon us to be aware of the possibilities and to assess (and to prepare according to corresponding risk assessment) instead of being completely ignorant or in denial. I have captured the orbital elements and base map of this week’s position of KMS 3-2 from the real-time satellite tracking website, n2yo.com, and added the dates and visualization of detonation. Coincidentally, as most of the U.S. population is east of the Mississippi River, optimal damage (from an EMP on this orbit) would theoretically occur anywhere from mid to late week or into next week. …thought you might be interested to be aware of this.